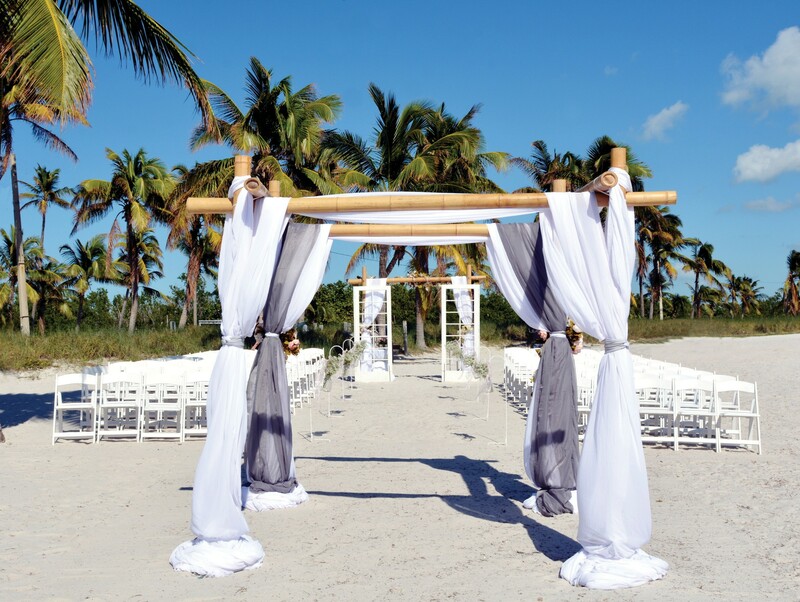 ACCORDING TO THE KNOT, THE PANTHEON of all nuptial-related knowledge, the Florida Keys rank in the top 50 locations for destination weddings in the world. This should come as no surprise to anyone who’s ever visited the beautiful island chain, with our sandy beaches, clear water, and statuesque palm trees swaying in the breeze. The popularity means that wedding season, which typically spans from November to May, is a relentless and unyielding time for many in the hospitality industry. Ask the average florist how many weddings they have to prepare for any given weekend in February and it’s not uncommon to hear numbers into the 20s. 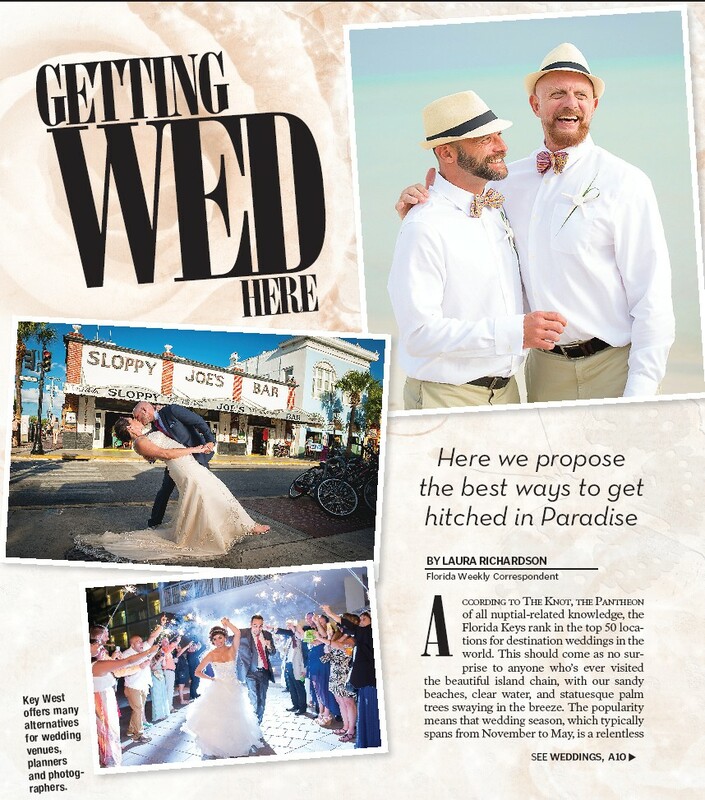 But now that the unbearable summer heat has arrived, wedding season in Key West has, mercifully, slowed down enough for the island’s various planners, florists, caterers and musicians to catch their collective breath after yet another jam-packed year. Maybe it’s the hypnotic lilt of palm fronds, or the seemingly endless gradient of blue-green ocean that greets you when you step out of the airport. Maybe it’s the pervasive feeling of unity and acceptance, or that on an average night here it seems like anything could happen. Or maybe it’s just that everyone looks better backlit against one of our famous sunsets with a glass of champagne in his or her hand. 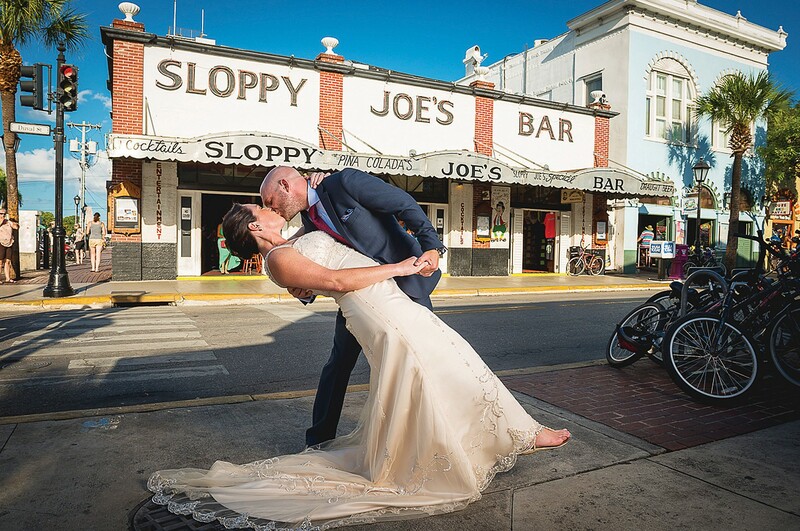 Whatever the reason, one thing’s for sure: Key West tends to bring out people’s romantic side, making it a prime location for engagements and destination weddings. 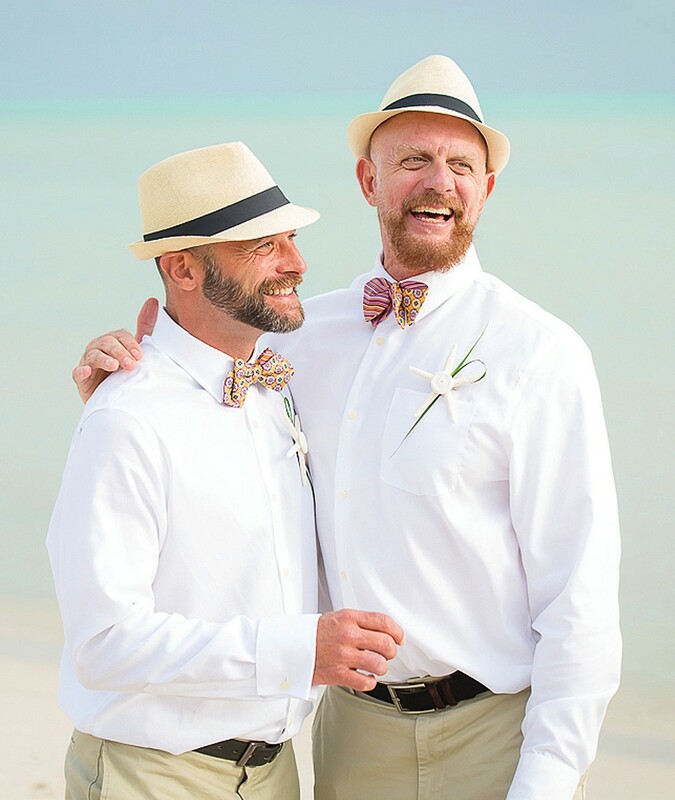 And with the historic Supreme Court ruling on marriage equality, Key West’s gay-friendly atmosphere has made its popularity as a place to get hitched skyrocket. If you’re not from around town, planning a wedding on an island that’s closer to Cuba than it is to a Whole Foods can seem daunting. We tapped a few local big shots in the events industry to spill the beans on who to hire, where to book and how not to lose your mind when planning your big day on our tiny island. Key West offers many alternatives for wedding venues, planners and photographers. We all know the drill: A wedding should be about love, family and the promise of forever. But it’s hard to feel inspired about spending the rest of your life with someone when you’re stuck talking to your drunk Aunt Mildred in a badly lit hotel ballroom that smells like day-old shrimp. Where you say “I do” is arguably the most important aspect of your wedding, so it’s vital that you nail down the perfect venue before anything else. 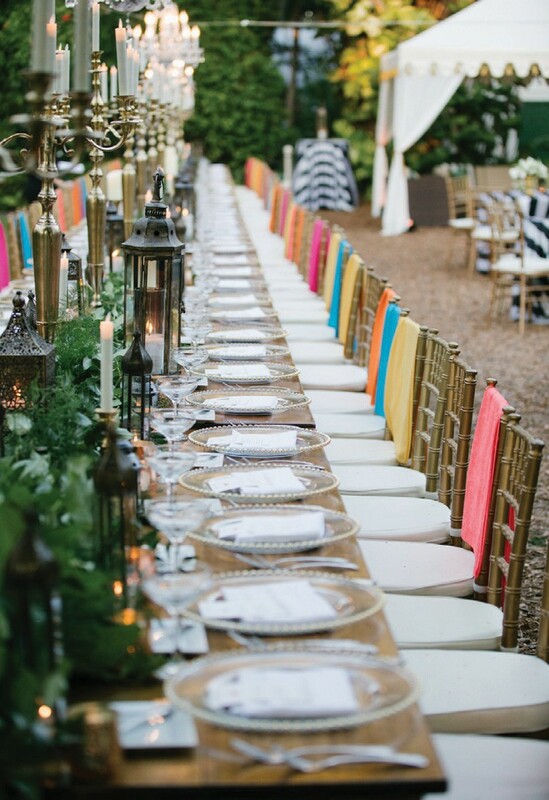 Add in a killer band and tropical-themed catering, and suddenly everyone’s clamoring to RSVP. Whether you’re a history lover with a penchant for polydactyl cats or you dream of reading your vows to a soundtrack of softly breaking waves, Key West has a venue to please almost everyone, and with price points ranging from a few hundred bucks to the tens of thousands. In 2017, the average Key West wedding cost the happy couple $28,000 for 100 guests — however, savvy twosomes can certainly plan a less expensive shindig if they know where to start, and, more importantly, when. 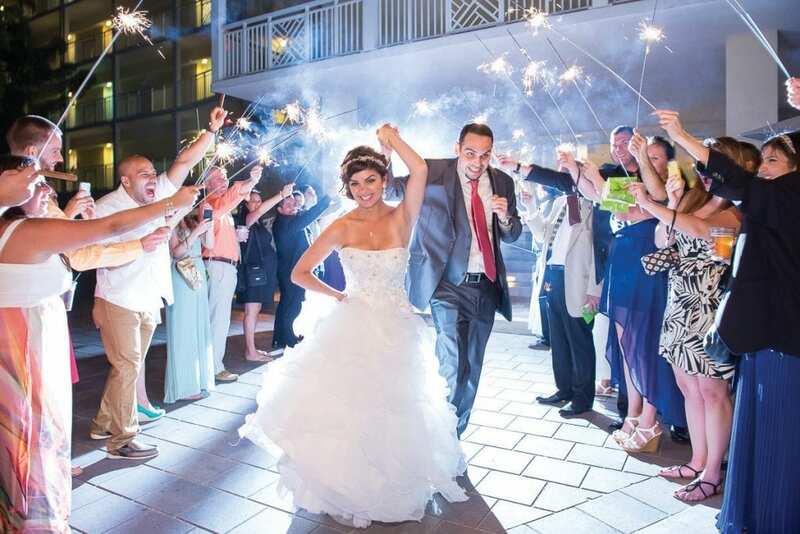 Unlike Vegas, last-minute wedding packages in Key West are rarely the most economical choice. But with a little foresight, the right team and more than 70 venues to choose from, your dream wedding in Key West might be easier to pull together than you think. There are hundreds of beautiful locations in Key West, but when it comes to weddings, we’re partial to a big tropical garden. 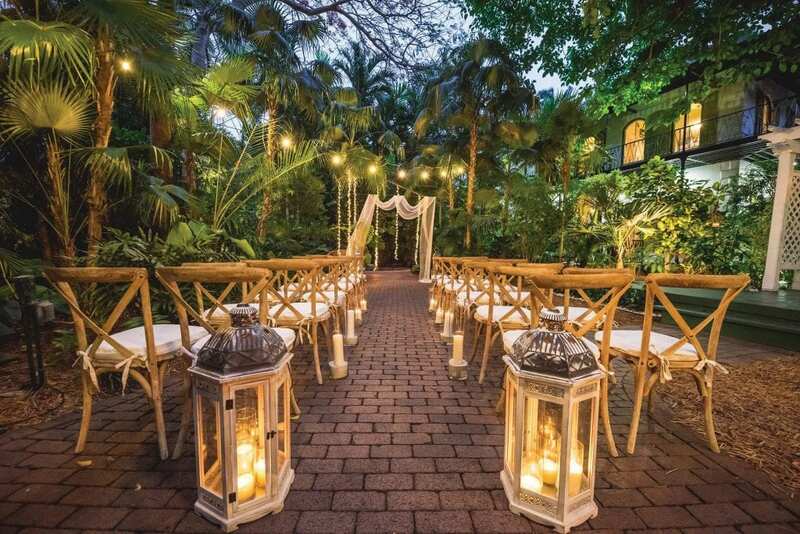 There’s just something about saying “I do” under the aroma of blooming flowers that screams “Wedding in Paradise.” Two of Key West’s most popular wedding venues offer lush foliage alongside a heavy dose of history: the Hemingway House and the Audubon House & Tropical Gardens. Neither comes incredibly cheap, but with a few tricks up your sleeve you can secure one of the island’s most romantic venues for less. At the Hemingway House, whose picturesque grounds and literary fame make it a must-see for any Key West visitor, Friday and Saturday rentals can cost upwards of $3,000. But switch your booking to a Thursday night, and the price drops a whopping $1,000. The house and its grounds, both meticulously landscaped and centrally-located, are one of the most sought-after venues for special events in Key West, so booking early is recommended. Feline ushers are free, but not guaranteed to follow direction. You’ll certainly reduce the cost of your floral budget if you choose to wed at the Audubon House. This gorgeous garden is resplendent year-round, while the onsite museum (which will stay open for your guests throughout your rental period) hosts three stories of naturalist John James Audubon’s colorful ornithological prints. The garden is magical at nighttime; the combination of twinkly landscape lighting and the natural beauty of the grounds means you can skimp on the extra decorations. Like the Hemingway House, Sunday through Thursday rentals are much less expensive. An important note: the Audubon House requires couples work with a wedding planner. Our local picks? 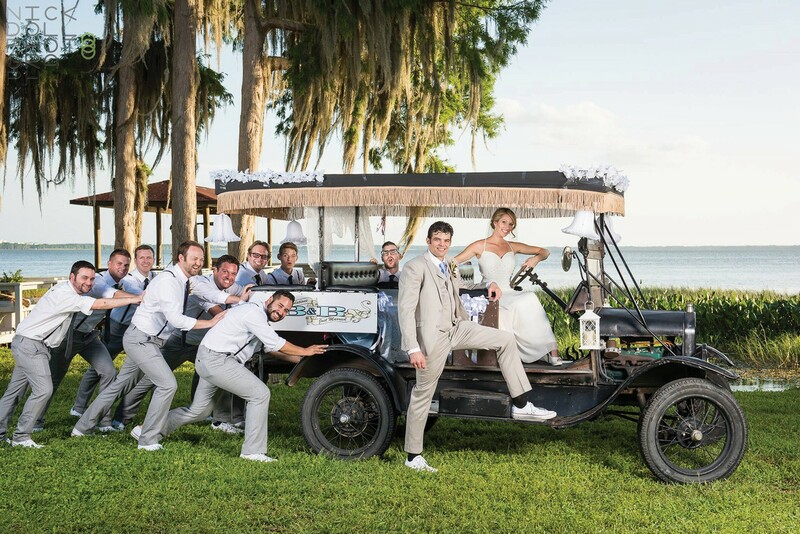 Powerhouse Julie Shreck and her company Simply You Weddings and Nika Stroble with Soiree Key West. Both Audubon and Hemingway are good for larger groups, but if you’d prefer to keep your wedding party to close friends and family, the West Martello Garden Club might be the perfect fit. 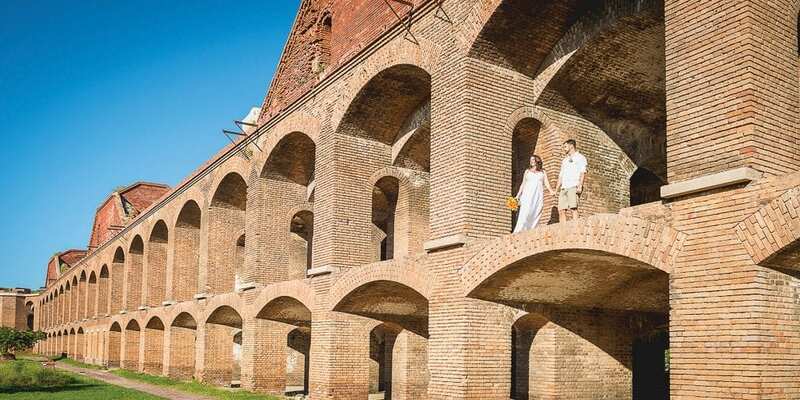 Topping out at 40 people max, you can host your ceremony inside this Civil War-era fort, the perfect match for history buffs and those seeking a tropical paradise. Between $350 and $400 buys you two hours to say your vows inside a tranquil oasis with views of the ocean. Adding a reception will cost you extra – it’s a five-hour minimum that, combined with the ceremony, will cost you $950 — but the party expands the guest list capacity to 100 people. All three venues — Hemingway, Audubon and West Martello — offer unparalleled privacy, and will supply a list of preferred vendors from which couples can choose their catering, music, party rentals and anything else. Once you’ve picked the perfect place, you’ll need to feed the hungry hordes who arrive to help celebrate you and your partner. There is a plethora of catering options on Key West to please even the pickiest of palates, and too many options can lead to feeling overwhelmed (a surefire appetite killer). We rest assured knowing that, when it comes to luxury and consistency, Julie Shreck and David Fuhrman will make sure guests leave every event feeling satiated and pampered. 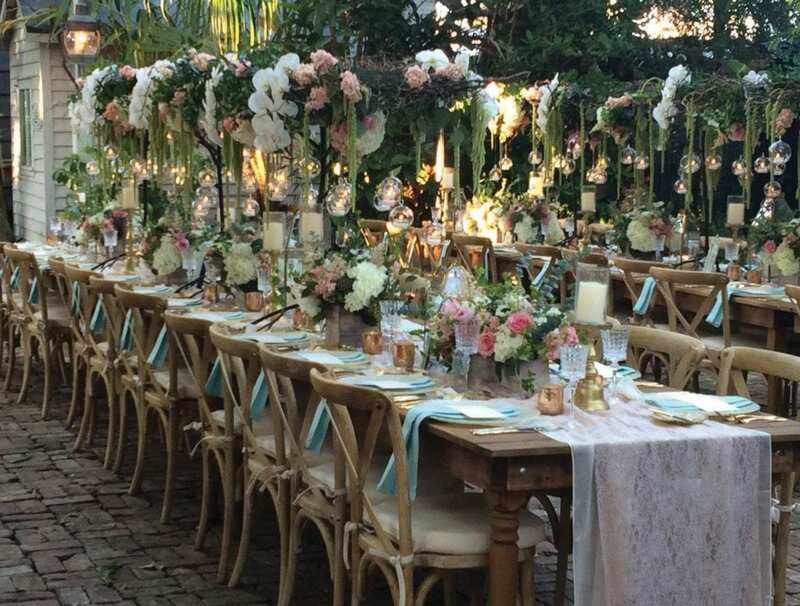 Her family’s catering company, Great Events, is a one-stop shop for wedding traditionalists who want to dazzle their guests with high-end food, flatware and furniture. Ingredients are seasonal and wines and liquors are premium. Cabernet poached fig crostini, lobster tacos, white truffle cheesecake and fresh-caught seafood served island-style are presented beautifully (and by a staff so particular about timing and etiquette you’ll feel like you’re dining with royals). Great Events isn’t budget catering (if cost is your primary issue, perhaps look elsewhere). But if you’re looking to impress and inspire, look no further. A deadbeat band can kill a wedding’s vibe faster than you can say “polka.” For a classically Caribbean take on ceremony music, we love Toko Irie’s blissed-out steel drum version of Wagner’s Bridal March, sure to elicit smiles from even the most stoic of guests. For the reception, we trust Mile Zero Entertainment to take care of the rest. Pop, soul, funk, Latin groove, calypso, hard rock, you name it – the team at Mile Zero will arrange the band that best fits your event and will make sure the only thing your guests complain about the day after is how sore their feet are from dancing. If you’d rather have the flexibility of a DJ, Soundwave Productions is our pick for the most reliable operators in the business. This family-owned (Jim and Joanna Cooper) and operated company is known for their professionalism and decades of experience. While you’re at it, splurge on a videographer from Mark J. Pierson Films – it’s so worth it and you’ll love Marky Pierson’s creative and unique take on the wedding film medium. For dessert, Key West Cakes will create the confection of your dreams. 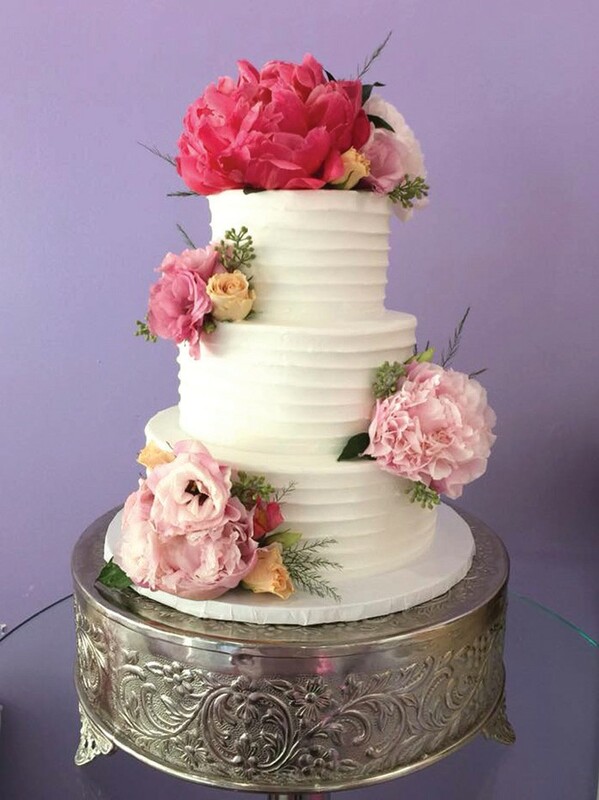 The supremely talented bakery is capable of crafting the most beautiful cakes one can imagine (but it helps to bring an inspiration picture, just in case). 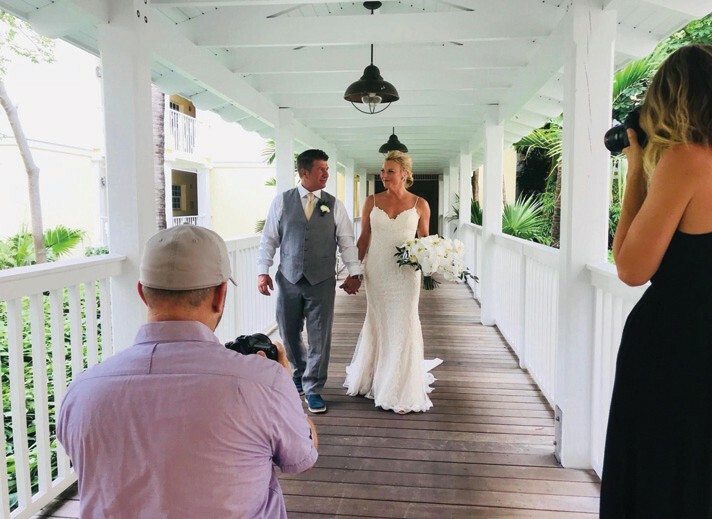 You’ve got the cake, the spectacular setting, the dancing relatives, and hundreds of licked-clean plates – now make sure you remember the whole thing by hiring the best photographer on the island. That would be Nick Doll, who’s known for his uncanny ability to capture wedded bliss blooming in the moments you’ll actually want to remember (no cheesy staged poses or sneezing bridesmaids, thank you very much) and his ability to put couples at ease during his photo shoots. Doll works hard, and often, so you’ll want to jump on booking him as soon as you can. Then practice your happiest day-of-my-life smile in the mirror for a few months (it’s all in the eyes, really). Capture your precious moments on video. are a quick cab ride to downtown Key West and perfect for a quick, barefoot ceremony that’s beautiful but affordable. Although you’re saving on the event space, you may still want a few flowers to brighten up your nuptial backdrop. There are plenty of capable florists in Key West, but there are two in particular that set themselves apart: Mama Flowers and Love in Bloom. Both have years of experience and are capable of producing displays that range from rustic to elaborate. Be honest about your budget with either vendor, and both will go above and beyond to ensure that you have the most beautiful blooms you can afford on your wedding day. Love in Bloom also has a wide variety of wooden arches and other nature-inspired rentals for all your wedding day décor needs. Cakes by Carol is known island-wide for its beautiful, flavorful cakes. It’s been known to craft some sky-high, elaborately decorated masterpieces, but the bakery is also known for its ability to work with budgets both large and small. The attention to detail is unparalleled (even In Touch magazine has dropped the Cakes by Carol name), so even small-budget cakes are sure to impress. For the main course, 3 Fine Cooks catering has built a strong reputation for a refreshing down-to-earth attitude, budgetary transparency and memorable food. They’ll recreate your favorite dishes and help you put together a menu for your wedding that fills your guests without emptying your wallet. If you’d like to save money on hiring an officiant, take note: all Florida notaries are technically capable of officiating a marriage, and can charge no more than $10 to perform the ceremony. Just make sure you bring your marriage license, which, in the event you’re willing to complete a fourhour marriage preparation course (relax, you can do it by video and it’s only four hours long) you can acquire without the usual three-day waiting period, and for $32 less than those who’ve declined to take the course. Apparently, it does pay to stay in school.